From Monday the 29th of April through to Sunday 5th of May, Sydney Writers Festival will be exploring all things Lie. Polite lies, filthy lies, lies for self preservation, lies for power and lies to torture. Lies that we tell others and lies that we tell ourselves. Not to mention, lies that those in power tell us to subdue the masses. Tickets are now on sale and the 2019 program has been released. Go check out the official website to see all the wonderful events. Toni Jordan’s Editing Your Fiction Manuscript workshop looks particularly good, as does Elaine Castillo’s workshop (Re)writing the Canon – Fan Fiction and Other Radical Acts. I believe that Bryan Washington’s On Murakami will definitely be one to blow your library-card socks off, and the best thing is, it’s freeeeeee. Although, my personal favourite event of the festival, is always the NSW Premier’s Literary Awards held at the NSW State Library. Canapes, I love ’em. And yes, I am a volunteer, how can I help? On May 11th Pauline Findlay and I launched #SelfPubIsHere along with a merry band of self-published authors which included #LoveOzYA superstar Ellie Marnie. My debut post urged self-publishing Avengers to assemble for a self-publishing festival in Australia. The movement went gangbusters and got covered in Books+Publishing and Australian Self-Publisher. Last night Ellie wrote her own post doubling down on needing our own festival. And to be honest, it had too many good quotes for me to write them all here because I’d simply be rewriting the whole article, so I urge you all to read it. It is all about making that previously hidden aspect of publishing such as rights management, formatting, cover design, editing, etc visible in a way traditional festivals simply cannot. Find the article here and enjoy! So what do you think? Are you ready to assemble for a #SelfPubIsHere festival? P.S. You can find Ellie Marney’s books here. Last week for #SelfPubIsHere I spoke about editors that I love, people who make your manuscript glow. But what about before you have a manuscript? Are there people who can help you before you have finished, or before you have even started? The answer is quite simply yes, writing teachers exist. And fortunately we live in a time where there are more and more teachers available to learn from. I’m going to share with you some writing teachers that I love and where to find ones that you’ll love too. And if there’s one thing I know, it’s quality teaching. Not only did I teach for over a decade, including being Acting head of English, Drama coordinator, placed on secondment briefly to the body now absorbed by NESA amongst many other things, BUT I also studied directly with the creators of Quality Teaching and Productive Pedagogy. So trust me, I know teaching, and I say these people are awesome. Toni Jordan is a truly incredible teacher. The three scenes that are consistently held up as excellent by critique partners of my WIP were all written during Toni Jordan’s Character and Dialogue course held at NSW Writers’ Centre. She is Melbourne based and has lectured at RMIT, presented extensively at The Wheeler Centre, tutors at Writers Victoria, and indeed lots of other places too. You can even get personalised mentoring from Toni through Australian Writers Mentoring Program. She has really strong opinions on structure and dialogue tags and is not afraid to state exactly what they are, which is very useful in a teacher. And although her opinions are strong she is never brutal; think of Toni as the epitome of firm but fair. Find Toni Jordan’s website here. Find her books here. Find Toni’s Robinpedia entry here. I was lucky enough to do Pamela Freeman’s two day speculative fiction course a few years back. Since then, she has taken me under her wing and allowed me to ask her all sorts of inane questions. She is the kind of teacher who continues on thinking about her students long after the classroom door has closed and the lights have been shut off. She is very much the mother duck of the Australian writing teaching world, but with a truly wicked sense of humour. She has a PhD in writing, she knows her stuff, and she’s quite forward in telling people what she thinks. And you’re in luck, because Pamela is currently supercharging her Advanced Fiction Writing Course at AWC. She is a regular teacher at AWC who also have a mentoring program, teaches occasionally at NSW Writers’ Centre, pops into a couple of Sydney universities, and all around the place really. Find Pamela Freeman’s website here. Pamela gets bonus points for following along on the #SelfPubIsHere twitter storm. Find her books here, and her books as Pamela Hart here. A woman that needs no introduction, Anita Heiss. She’s pretty much an icon in Australia. When I was volunteering at one of her panel events at the Sydney Writers’ Festival we had to form a separate line for her signings. She is a really practical teacher who urges writers to listen to their readership. She’s all about knowing what you write. Very thorough in her approach and her preparation is phenomenal. I was lucky enough to do a workshop with her at NSW Writers Centre but she teaches at a lot of other places too. Keep your eyes wide open to see her courses pop up and book quickly. Anita Heiss’s website can be found here. Find Anita’s books here. Emily Maguire is a very quiet and serene teacher. She is never without an encouraging word for people and always listens to students thoroughly before responding. Emily also provides so many worksheets for you to take home so that you can continue to look back and relearn for years to come. She teaches the hugely popular Year of the Novel course at NSW Writers’ Centre and so you get to learn from Emily all year long. Find Emily Maguire’s website here. Find Emily’s books here. One of the most exciting speakers I have ever seen is L.A. Larkin. She is very animated, very witty, and above all else, very clever. L.A Larkin mainly teaches in the UK but lucky for us the AWC recently snapped her up to teach crime writing so she’s not just swanning around British universities anymore, we can learn from her in Sydney. You can also find her speaking at a variety of other places, check L.A. Larkin’s website for details here. Find her books here or even here. Find L.A. Larkin’s Robinpedia entry here. Jan Cornall is the first writing teacher that I ever had (aside from school) and she blew me away. She is a very calm person and has a soothing effect on the soul. Jan utilises short bursts of meditation in her teaching and, despite the fact that I am truly crap at meditating, it really works. She teaches at WEA, NSW Writers’ Centre, pretty much everywhere and runs her own draftbusters course in the Inner West that I cannot recommend highly enough. Find Jan Cornall’s website here. Find Jan’s books here. I have long testified that Walter “the inconceivably incandescent” Mason is like viagra for the creative soul. This man simply oozes love and passion. To sit by him is to sit in the presence of inspiration. But he doesn’t just sit about being all inspirational, he also gives concrete tasks to do. He really is a spectacular speaker and I urge you to go see him whenever you can. He regularly teaches at WEA, Sydney Mechanics’ School of Arts, NSW Writers’ Centre, Ashfield Library, and pretty much everywhere you can think of. Find Walter Mason’s website here. Find Walter’s books here. Find Walter Mason’s Robinpedia entry here. Alison Croggon would come close to being the queen of Australian literature. She’s a poet, a spec fic writer, an opera critic, and so much more. You want to know how to write an arts submission? She’ll teach you. You want to know how to write a proper poetry review? She’ll teach you. You want to know how to write a fantasy novel? She’ll teach you. And, like Toni, you can have Alison all to yourself through the Australian Writers Mentoring Program. Find Alison Croggon’s website here. Find Alison’s books here. Bonus, she’s a huge #SelfPubIsHere advocate. I did a Garth Nix course through ASA waaaaayyyy back in 2014. I rarely see his name crop up on workshops so was eager to attend, I think it pretty much booked out on its first day of advertisement. First up, the food they provide for the ASA courses is fantastic, seriously, if you haven’t done a course there yet… well… do it! Secondly, I was really impressed with how Garth took a different tac than many other teachers. He was explicit on who to pitch to, he was explicit on filling up your creative bank. It was a very informative workshop. He said nice things about my WIP, and as I am a complete saddest I have subsequently changed it from being set in Germany to Australia, from first person to third person from present tense to past tense. Whyyyyy??? Imagine what I would have done with negative feedback or if he’d actually suggested any changes? Burned my laptop and thrown it from the Harbour Bridge? Find Garth Nix’s website here. Find Garth’s books here. Cass Moriarty is from up above… in Queensland. She is a tireless supporter of writers and somehow manages to write novels, write reviews of ALL the books, teach and be a doting grandmother. I am in awe of this woman and have no idea how she does it all. Her motto is ‘I can adapt’ and she brings that to your manuscript. You can find her floating about up at Queensland Writers Centre where she does workshops and mentoring. Find Cass Moriarty’s website here. Find Cass’s books here. Find Cass Moriarty’s Robinpedia entry here. Thriller, chiller, and teacher Tania Chandler has been writing and editing for years. Recently, we’ve been lucky enough to see her helm her own workshops. She brings a wealth of experience with her, and is a very dedicated teacher. If you get a chance to get to SPAN Community House Inc. book in for a course with Tania. Find Tania Chandler’s website here. Find her books here. Find Tania Chandler’s Robinpedia entry here. Aleesah Darlison is here by very special request, my 6 year old daughter’s request to be precise. I have not had the pleasure of learning from Aleesah but my daughter has. Aleesah visited her school last year and my daughter assures me that Aleesah is the best teacher ever, and very qualified. My daughter tells me that Aleesah has written over 100,000 books, and writes 1000 a week, so I’m fairly confident she’ll teach you a lot about time management, and possibly how to create time vortexes. We actually owned quite a few of Aleesah’s books before she went to may daughter’s school so my daughter’s claims are way less exaggerated than you think. Aleesah is a powerhouse. My daughter rarely steers me wrong so in order to keep tabs on the clearly enchanting Aleesah Darlison find her website here. Find Aleesah’s books here. Find Aleesah’s Robinpedia entry here. And no list could be complete without #SelfPubIsHere rockstar Ellie Marney who teaches both YA and self-publishing workshops. You can find her slinking around Writers Victoria and plenty of other places too. Just keep those peepers peeled. Find Ellie Marney’s website here. Find Ellie’s books here. This is a list of general writing teachers that I highly recommend, I will do a blog entry on self-publishing specific courses later on. Now of course there are other fab writing teachers out there and I can’t possibly go learn from every single one of them, so I’d like to hear about who you love. Especially those fab teachers such as Natasha Lester who I hear so much about from WA friends. Which writing teacher really boils your potato? Find friendly writers organisations here. Just click on “8. What other organisations in Australia support writers?” These places have been created to help you grow. They can and will help you. They have an array of courses and resources. Also in Australian Self-Publisher here. Read about my #SelfPubIsHere Festival dream here. I think self-publishing needs greater recognition from Australian Festivals and Awards. I think self-publishing deserves its very own day at one of the larger Australian writer festivals, or even it’s very own self-publishing festival. We have kids days and YA days at major festivals (check out the one at Sydney Writers’ Festival, it is AMAZING), why not a self-publishing day? It is absolutely booming at the moment with more and more people not only buying self-published books, but wanting to become self-published authors. Publisher Weekly has reported that self-published ebooks represent 31% of ebooks on Amazon and this trend is increasing. Not only do they account for around a third of ebooks, they are also dominating sales. Self-published authors are surpassing traditionally published authors on Amazon in crime, speculative fiction and romance. They also have a big share of the market in all other genres. The big five traditional publishers only account for around 16% of ebooks on the Amazon bestseller list, all the rest are self or indi. And let’s face it, ebooks are big business now and are here to stay. Many readers have no idea if the books they are reading are self-published or not. As publishing houses laid off inhouse editors and designers in favour of a freelance system, self-published authors were able to snap them up. As such, the self-publishing route is becoming increasingly popular and destigmatised not only amongst up and coming writers, but also those already traditionally published and seeking to take greater control of their work. Despite this increase in popularity and quality many Australian literary festivals and awards have either ignored the self-publishing market or given it a one off panel. Often in Australia the panel discussion is merely about if self publishing is ruining the industry or not. ¯\_(ツ)_/¯ The interest in self-publishing however is growing and has moved far beyond festival goers wanting to hear a simple discussion on if self-publishing is good or evil. They want in. Publishing your own book can be hard work and getting it into people’s hands can be even harder. This is a process that the increasing number of readers wanting to turn into writers are curious about. And honestly, readers also want the opportunity to see these self-published authors in person to get their books signed. A self-publishing festival or day would be unique from other festivals in that self-published authors have to have a hand in all areas of their book development. They need to be able to source or become their own publicist, designer, formatter, bookseller, etc. Literary festivals often focus on authors and publishing houses, a self-publishing event would highlight self-published authors along with editors, cover illustrators, designers, and publicists. It would bring the often hidden side of publishing to the forefront. The part that happens behind closed doors that writers and readers are increasingly curious about. The parts they are willing to pay to find out more about. And I don’t mean in just one genre, I mean across all of self-publishing rather than a genre specific festival. Romance has traditionally been quite accepting of self-publishing and has on many instances lead the way but it’s time for other organisations to step up. Below I will outline some of the awesome feature a self-pub fest would provide readers and writers hungry for something new. Self-published writers are essentially split into three groups, those that started self-published and get picked up by a traditional publisher, traditionally published authors who have turned to self-publishing (some vow never to return to the trad-pub model, others happily flit back and forth enjoying the hybrid life), and those that have started as self-published and never looked back. Each of these groups bring unique insights and appeal to the curiosity of readers and fellow writers. We would hope to attract presenters from each of the group, with examples of the types of authors listed below. Self-published authors picked up by traditional publishers include authors such as Matthew Reilly, CS Pacat, Bruce McCabe, and Mitchell Hogan. People want to know how these guys made the conversion. It’s the dream for many starting out. Self publish, get picked up, and then have a movie trilogy made, I’m looking at you E. L. James. Authors who started out as traditionally published and have then experimented with self-publishing include people such KERI ARTHUR (I’m putting this in capitals and bold because I somehow missed Keri’s name and am editing it in! ), Lisa Heidke, John Birmingham, Ellie Marney, Maria Lewis, Ciara Ballantyne, Kim Kelly, and Alison Croggon. Everyone wants to know why they broke ranks. What is so fantastic about self-publishing that it attracted them? How did they do it? Is it more profitable? What are the benefits? Hybrid or abandonment? Australia has an incredible array of self-published authors that have started that way and remained true to the form. Melissa Pouliot had a cold case reopened because of her debut book. Heidi Farelly was picked up as a regular guest on A Current Affair to speak on finances on the strength of the popularity of her self-published ‘How to…’ books. Lisa Fleetwood became an Amazon bestseller with her debut travel memoir. I myself have been picked up by bookstores for my memoir about postnatal depression and my book is even being used by some postnatal depression support networks. Lola Lowe was listed as a “Must Read” by Cosmopolitan Magazine for her debut novel. A.B. Patterson, a former detective Sergeant, has won three awards for his debut crime fiction novel, and been short listed for two others. Dionne Lister is a speculative fiction author who is an outspoken advocate of self-publishing and has been short listed for three awards. Elizabeth Cummings has been invited all around the world to talk about her picture books, in particular The Disappearing Sister – an important book that deals with speaking to and helping siblings of children with anorexia. There are many more self-publishing success stories amongst the Australian public eager to share their story and people want to know how they did it and how they can replicate it. Representatives from printers such as Ingram Sparks and Publicious. Representatives from self-publishing consultancy services such as Critical Mass Consulting, Bookends Publishing, and The Author Whisperer. We need a location or a festival to give us a venue for a day. We need an organiser / convener that people respect. We need a publicist, although, many self-published authors are their own publicist and do a damn fine job. Volunteers, we need people pointing and smiling. Trust me, it helps a lot. We need all the food. We need a dynamic bookseller who loves us. We need those guests that represent the full gamut of the self-publishing experience. And, without question, we need all the wine and cheese. And don’t just take my word for it, read Pauline Findlay’s thoughts here. She strongly advocates for more self-publishing recognition. Ellie Marney also thinks a #SelfPubIsHere Festival would be great, read about it here. Find out what Lisa Fleetwood has to say about this here. Find out what Rebecca Chaney thinks here. Image courtesy of super babe Josie Neeves Photography. 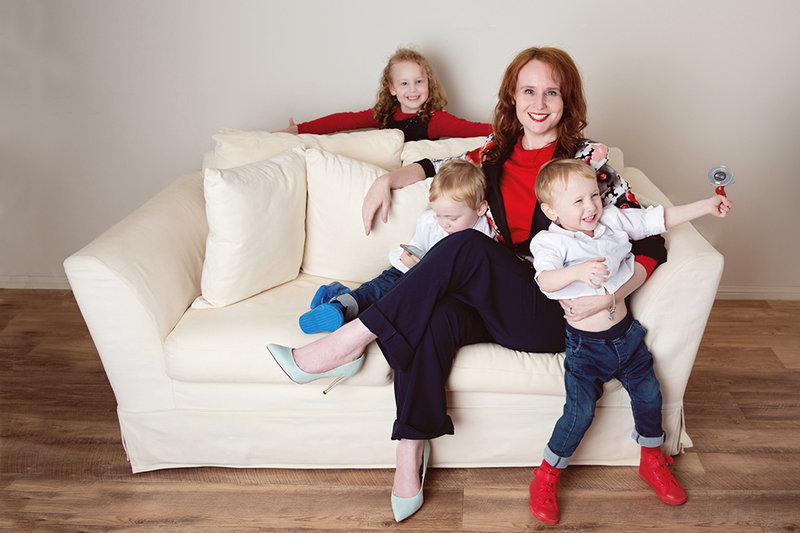 Tania Connolly recently conducted an interview with me about my experience with postnatal depression and having three under three. Hope you enjoy it. It is always interesting for me reading about my own experience but from another person’s perspective. How did you find reading my story, that you’re used to hearing about from me, through Tania Connolly’s lense? How does it compare to my first ever interview with one Lauren Ingram? 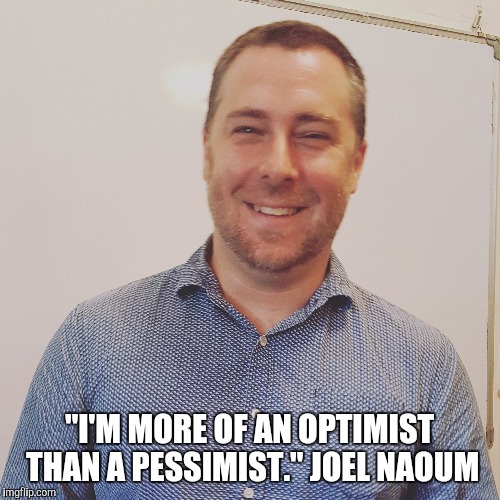 Who is Joel Naoum? A man, yes. A human being, yes. A carbon based lifeform, yes. But is there more to him than being a mamal and living on Earth? The answer will surprise you, for it is yes. Naoum began his life as child to Australian writer Dianne Blacklock (can’t find her on Wikipedia so rest assured she will be getting her very own Robinpedia entry). Sitting by her side he absorbed a love of books but as a social butterfly he could not see fit to cocoon his radiance in the solitary world of authorship. One year his mother took him to the Sydney Writers’ Festival (why yes I am a volunteer, how can I help) and he found that despite being introduced to cool authors such Andy Griffiths and Garth Nix he was himself more attracted to the lurking representatives from the publishing houses. A fire was ignited within the belly of the young Naoum and he set his heart upon joining the publishing industry. Pan MacMillan gave Naoum his first job in the publishing sphere. He both horrified and delighted his interviewer by telling her about his love of the new technology ebooks (he’s older than he looks, it was new back then). She loved his innovative approach, she did not so much love that he somehow had an illegal electronic copy of one of Pan MacMillan’s titles. He did not know it was illegal prior to this point and does not recommend it as an interview strategy. Fortunately he still got the job. Not only did Naoum get the job but he thrived. He was awarded the Unwin Fellowship and was able to travel to the UK and learn all about the innovative things UK publishers were doing in epublishing. He spent three months in the UK learning the secret business of a variety of publishing houses. After his fellowship ended and Naoum returned to Australia he was selected to head up Pan MacMillan’s digital first imprint, Momentum. Their original goal was to still be able to publish mid list authors that there was no longer shelf space for after the collapse of Boarders. Because they love authors and stuff. The focus of Momentum changed as they came to realise that the ebooks that sold well were more genre based such as romance, crime and spec fic, not so much literary Australiana. Just quietly, e also love their self help and parenting books. In order to make money the imprint had to switch from its original purpose. Over a 5 year period Momentum put out 450 titles. Naoum, still committed to the digital world has now setup his own company, Critical Mass. This is mainly a self-publishing consultancy firm that helps self published authors get in touch with editors, designers, and gives marketing advice. He will also help people looking to traditional publish polish their pitches. He is there for you. In addition to this Critical Mass, Naoum has designed a course for The New South Wales Writers’ Centre, where he is a board member, that actually publishes student’s work. It is open to people with completed and edited manuscripts. Naoum then takes students through cover design, formating, connecting with a distributor, and finally, actually hitting publish and getting a print copy into their hands. Jump onto Joel’s website here. Chat with him on twitter here. Find out more about Robinpedia here. Read about The New South Wales Writers’ Centre Stick here.